Recently we started rolling out some changes to the way we handle and display quoted prices from some of our carriers. Carriers like eParcel, Sendle and Fastway now allow us to provide live rates so you can make quicker and more accurate decisions on who to ship with. If you have set up a Sendle, eParcel (Domestic) or Fastway courier you will now see rates on every order where they are valid. 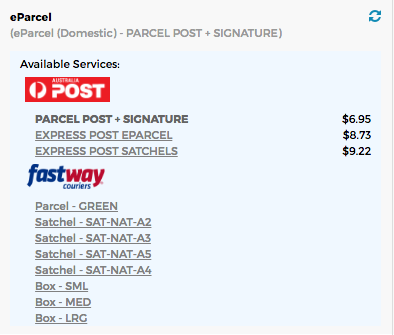 This will help you compare prices and decide the best way to ship your packages. Simply click the suggested rate to ship the order using that service. We will be adding live rates for other carriers, with eParcel International and Couriers Please coming in the next couple of months. Note: Due to limitations of the Fastway API, we are not able to get accurate prices. You will still see the available services but prices will not be shown. After you make changes to an order you can click the refresh icon to reload rates. If there is more data required to get a rate quote (eg, weight, order dimensions) then ReadyToShip will alert you. Just saying, we got 329 orders over the weekend and to process that on a Monday would have taken 3-4 hours before we used ReadyToShip. This morning I set my stopwatch and took it fairly easy. It took only 15 minutes and 22 seconds!